Open until 22:00 on Saturday, March 27 (extended opening hours)! Demonstrations of “Otemae” tea ceremony will be held in a tea room that is normally closed to the public. It was in the middle of the Edo Period that glass vessels were first made on a large scale in Japan. Glass dishes and plates for eating, combs, hairpins and stationary have at times been commonly accepted as the pinnacle of stylishness, and at others, a special pleasure for connoisseurs. In this exhibition you can experience the beauty of Wa-glass (Japanese glass), which became a part of everyday life during the Edo and Meiji Periods. The show also includes an installation using Edo wind-bells, only two of which remain in existence in Japan. *Last admission : 30 minutes before closing. *Sunday, May 2 to Tuesday/Public Holiday, May 4 open until 20:00. 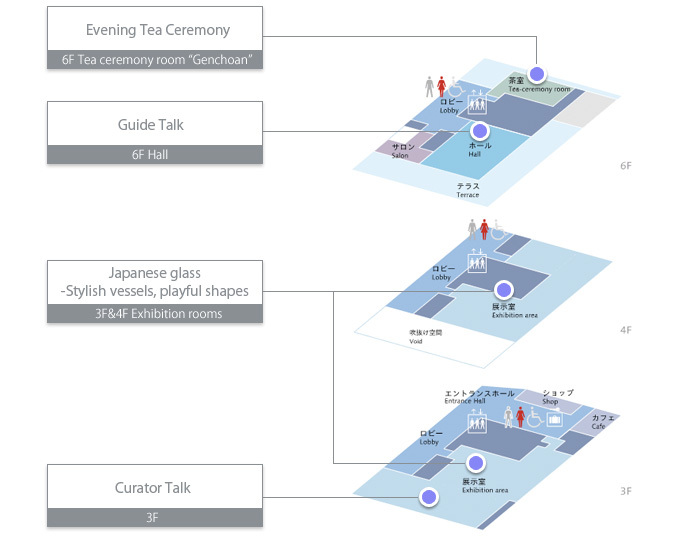 * These programs are for visitors to "Japanese glass-Stylish vessels, playful shapes"
The curator will give a lecture in the third floor gallery where the Edo wind-bell installation is being exhibited. An easy-to-understand explanation of the exhibition, suitable for everyone from children to adults. To coincide with the "Japanese glass" exhibition, we are pleased to serve usucha (thin tea) and sweets of the season using a glass tea set. Please enjoy a moment of relaxation in the tea room that has served to uphold the tradition of the museum since its establishment in 1961. In our combined shop and cafe you can relax and enjoy your memories of the exhibition. The shop is operated on the concept of "Japanese Modernism - Elegance in Life." The cafe is run by "Fumuro-ya," a well-known maker of Kaga-fu (Kaga style wheat-gluten cakes) in Kanazawa. The cafe will serve the following special items. The shop will hold a Roppongi Art Night sale. A selection of goods will be on sale at special prices.